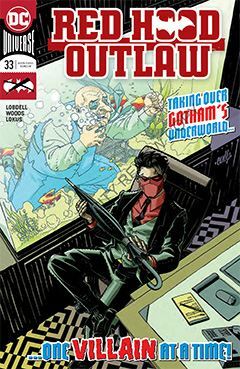 This issue continues to set the stage for Jason Todd’s return to Gotham City. He’s already taken the Iceberg Lounge from the Penguin, locking the mob boss away for his own amusement. But Penguin is not without his own resources, and has a contingency plan in the event of a prolonged absence. But you don’t take over a mob-run casino without having a mob of your own. It’s a good thing Jason has precisely that, because when Penguin’s contingency plan comes calling, he needs all the help he can muster to defend his new stronghold. Jason seems to have found some new outlaws to hang with, though they are not quite the equal partners Bizarro and Artemis were. Much of this issue is an extended fight scene, and that’s okay. Heck, sometimes you just need a good, old-fashioned action sequence to grab the audience’s attention. However, it’s difficult to understand this early in the story how these events will further the narrative – which why I hate judging a story one chapter at a time. I prefer to see how everything works together as a whole. Pete Woods is back at the drawing board, and doing his usual stellar job of it. I’m looking forward to seeing this story play out. I didn’t particularly care the Jason-Todd-plays-Jack-Reacher, nomadic troubleshooter concept they had going for a while. If I wanted to read something like that, I’d read, well, Jack Reacher.